Filled to the brim with goodness! 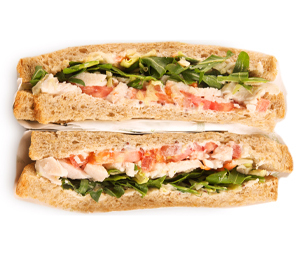 Spice things up with Banjo’s Cajun Chicken Salad Sandwich! Enjoy the smoky southern flavours of light Cajun spiced sauce with chicken and fresh garden salad. Chicken, capsicum, red onion, salad mix, cajun mayo, paprika, flour, salt, yeast, margarine, water. Other products manufactured on this site contain: milk, sulphites, poppy seeds, sesame seeds and nuts. Therefore traces may be present in this product. 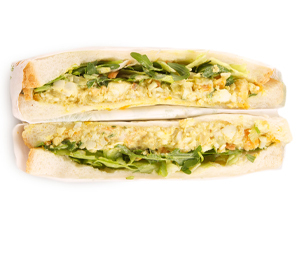 Banjo’s Curried Egg and Lettuce sandwich is deliciously creamy and light – with the perfect blend of curry and spices, no wonder this one is a crowd favourite. Available in full grain, wholemeal or white. Eggs, curried mayo, salad mix, flour, yeast, salt, margarine, water. 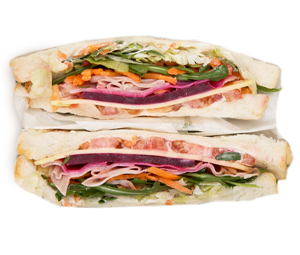 Banjo’s traditional Ham Salad Sandwich filled with delicious leg ham and packed with fresh garden salad – just perfect. Available in full grain, wholemeal or white. Ham, tomato, cheese, beetroot, carrot, salad mix, mayonnaise, salt, pepper, flour, yeast, salt, margarine, water. 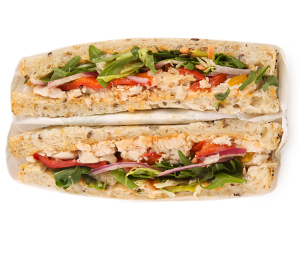 Try our tangy Chicken Seeded Mustard Sandwich! Tasty chicken in a seeded mustard sauce and packed with fresh garden salad – available in our finest full grain, wholemeal or white breads. Chicken, tomato, salad mix, seeded mustard, mayo, salt, pepper, flour, yeast, margarine, water. Banjo’s Vegetarian Salad Pita is fresh from the garden and handmade just this morning especially for you! Enjoy the natural flavours of crisp lettuce, sweet juicy tomatos, beetroot, Spanish onion, grated carrot and tasty cheese slices. 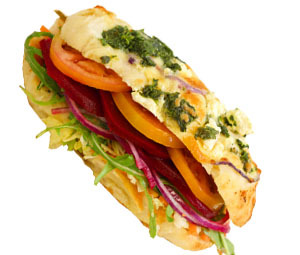 Tomato, carrot, salad mix, beetroot, red onion, cheese, salt, pepper, chutney, flour, yeast, water, spinach, ricotta, garlic. There’s no better accompaniment to Smoked Salmon than Banjo’s delicious Turkish pitas and fresh garden salad. 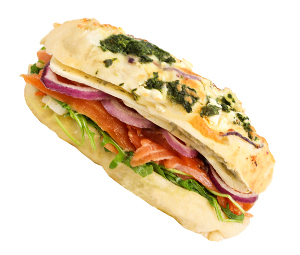 Our Smoked Salmon Pita brings it all together in a perfectly balanced healthy food option – delicious and nutritious! Smoked salmon, red onion, dill, salad mix, mayo, cream cheese, flour, yeast, salt, water, nigella, sesame seeds, spinach, ricotta, garlic, cheese. Enjoy the classic combination of Chicken and Avocado with our freshly baked Turkish pita and fresh garden salad. Banjo’s Chicken Avocado Pita is a healthy lunch option packed with nutrition. Chicken, avocado, salad mix, red onion, mustard, mayo, flour, yeast, salt, nigella, sesame seed, water. 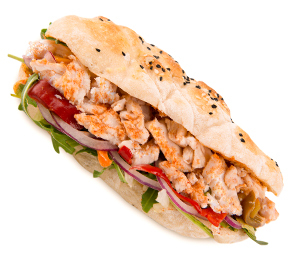 Spice things up with Banjo’s Cajun Chicken Pita! Enjoy the smoky southern flavours of light Cajun spiced sauce with chicken and fresh garden salad on a freshly baked Turkish pita. Chicken, salad mix, capsicum, onion, Cajun mayo, paprika, flour, yeast, salt, water, nigella, sesame seeds.